A friend of mine was kind enough to pick me up some purple corn at a Peruvian market after a discussion we had about the proper technique for making chicha morada, a traditional Peruvian drink. You don't want to hang out with the crowd I hang out with. We're troublemakers. Today was the first day I had the time available to make the drink which, while easy to make, takes a good deal of boiling, steeping, and cooling time. The drink was nicely refreshing for a July day that required me to have the oven going for approximately five hours. 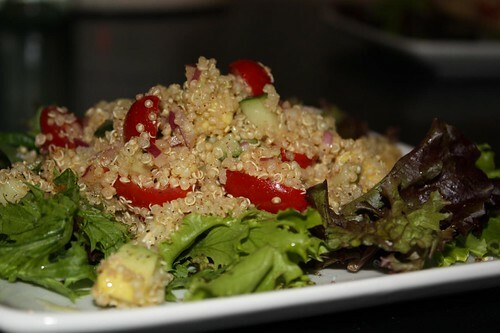 To keep with the Peruvian theme I also made a cool quinoa salad with lime, cucumber, tomato, red onion, avocado, and spices. My hatred of cucumbers was trumped by the fact that this salad needed a little color. Ideally I would have added some mint instead but the three leaves currently on the plant in our AeroGarden were not quite sufficient for the quantity of salad I made. While I can't find any indication that pork ribs are all that common in Peruvian cooking I decided to make a dry Peruvian style rub for these ribs, marinate them for the afternoon, then slowly roast them in the oven. The rub contained garlic powder, salt, pepper, cumin, and dried chipotles. 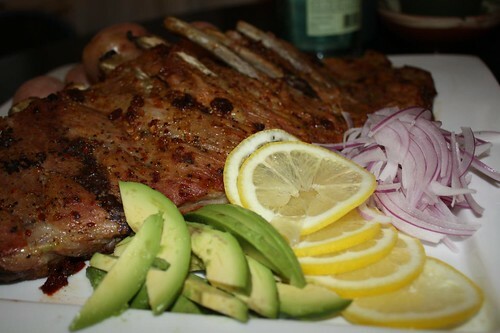 I also squeezed a lime and drizzled a little olive oil over the rack before letting it marinate. I then slow roasted it in the oven for a few hours and did not finish it on the grill because we do not have a grill because our life is sad and meaningless. In retrospect I would have gone a lot lighter on the chipotles. I couldn't decide between using one or two dried chipotles. Thankfully I went with one because these ribs were just a bit more than what I consider bearable for spiciness. My goal would have been to accompany this meal with some pisco but I couldn't seem to locate pisco at any local liquor stores. 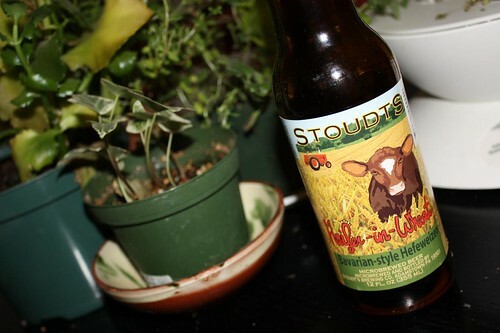 Instead I settled for this Stoudt's Heifer-in-Wheat beer from good old Adamstown, Pennsylvania. It is rather fitting since Pennsylvania's state motto is: "The Peru of North America." 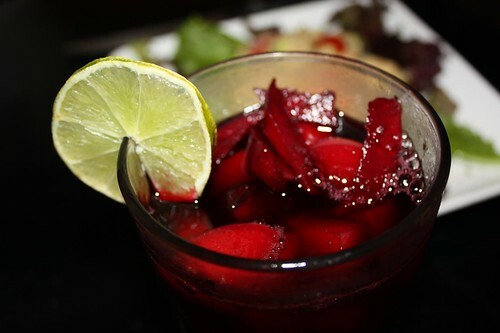 The friend who gave me the chicha morada recipe also gave me some tips on making a parallel recipe (mazamorra morada) using essentially the same base as the purple corn drink. My friend could not figure out the English word for the exact ingredient to use as a thickener so I took a guess and used cornstarch. I wasn't sure how thick you are traditionally supposed to make this dessert so I just thickened it to a pudding-like consistency. The dessert is supposed to be served hot -- something Jen's father would never approve of. 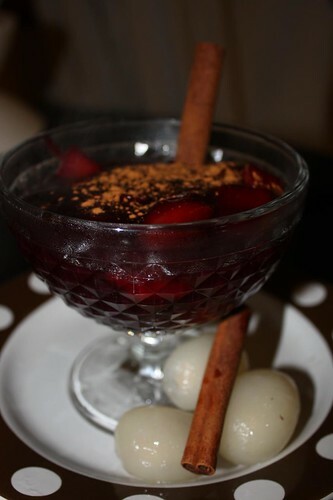 The dessert, much like the drink tasted very much like Christmas, sort of like a mulled cider. I'm impressed with Peruvians' ingenuity in making a sweet drink out of purple corn. With ideas like that it's a wonder they never found those lost cities of gold! darn tooting. warm deserts, bah humbug!